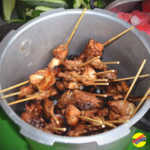 Marinate the chicken with soy sauce, minced garlic, calamansi juice, ground pepper, sugar, banana ketchup, and soda. Mix them well and keep in the fridge for at least 30 minutes or for some overnight. The favorite parts of the chicken for the barbecue are the thighs, breast, wings and drumsticks. Prepare the charcoal grill for grilling the chicken and grill them over hot charcoals turning on each side until every side of the chicken is cooked. Wait for the skin to become reddish then baste it with the marinade on each side. This video shows another recipe for chicken barbecue.